Centre for Democracy and Development (CDD) has called on the people of Osun State to refrain from acts that may plunge the state into crisis following INEC’s declaration of the Saturday’s governorship election inconclusive. The Director of CDD, Idayat Hassan, made the call, on Sunday, in a statement made available to the News Agency of Nigeria (NAN) in Abuja. She called on the electorate and all political camps to maintain calm. According to her, at this critical moment in the electoral process, CDD commends the voting public in Osun state `for its very peaceful conduct before and during the election. ”We call on the Osun electorate to continue with its calm and orderly disposition, as INEC works to ensure the electoral process is concluded in line with extant laws and guidelines governing the process. ”CDD, therefore, calls on all partisan camps to refrain from any form of rhetoric, claims or counter-claims capable of disturbing the peace or undermining public order,” she enjoined. 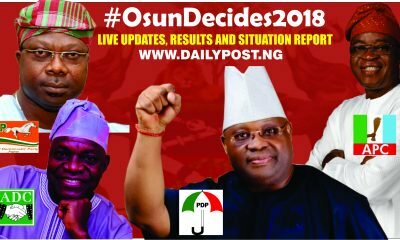 ”From the results so far released by the electoral umpire, CDD notes that the candidate of the Peoples Democratic Party (PDP), Ademola Adeleke, is leading the race with 254,698 votes. ”He is closely trailed by Gboyega Oyetola of the All Progressives Congress (APC) who got 254,345 votes. ”The number of votes separating the front-runner and his closest challenger is 354 votes. ”This number is lower than the total number of registered voters in Polling Units where the election was cancelled due to over-voting, ballot snatching and the disappearance of a presiding officer. ”According to INEC, these infractions happened in Orolu, Ife South, Ife North and Osogbo Local Government Areas (LGAs), leading to the cancellation of votes in five polling units with 3,498 registered voters,” she stated. Against the backdrop, the CDD director called on INEC and the security agencies to thoroughly investigate and prosecute those responsible for acts, which had undermined the electoral process in the affected areas. ”The INEC staffs to be investigated and prosecuted include those involved in the destruction of electoral materials, particularly the staff who tore the Form EC 8A result sheet in one of the Polling Units that was cancelled. ”Also, other ad-hoc staff that engaged in subverting the electoral process must be made to face the full wrath of the law. ”This, in our opinion, will enhance the credibility of the process and boost public confidence in the commission not just in the Osun governorship supplementary elections but the forthcoming 2019 general elections. ”It is pertinent to stress that speedy prosecution of those found culpable would not only sanitise the electoral process but would deter future offenders,” she said. She also called on the electoral umpire to put in place stringent measures to checkmate a reoccurrence of such acts. According to her, in line with world best practices, CDD call on INEC to make open its results collation processes. ”Also, the commission should publicly release the material tracking report in the spirit of openness and electoral transparency,” Hassan remarked.